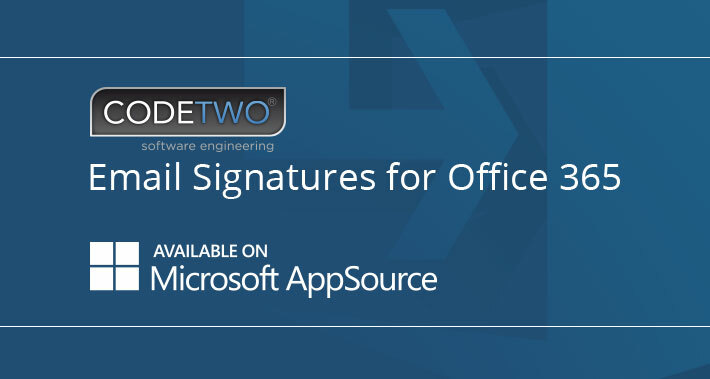 We are glad to let you know that our CodeTwo Email Signatures for Office 365, the application for central email signature management in Exchange Online, it is now listed on Microsoft AppSource. AppSource is a Microsoft’s platform where you can find trusted and reliable applications for your Office 365 organization. To be listed in AppSource, CodeTwo Email Signatures for Office 365 had to meet certain requirements. For example, the program needs to ensure at least 99,9% uptime, be easy to set up and use and be designed for business users (line-of-business SaaS model). As Microsoft states, applications that are available on AppSource need to deliver stellar experience to users who use them – and this is what you should expect from CodeTwo Email Signatures for Office 365. CodeTwo Email Signatures for Office 365 will help you create professional email signatures for both internal and external emails and manage them centrally for all users in your Office 365 organization. To find out more about the program’s features and to see how it ease email signature management, visit this website.